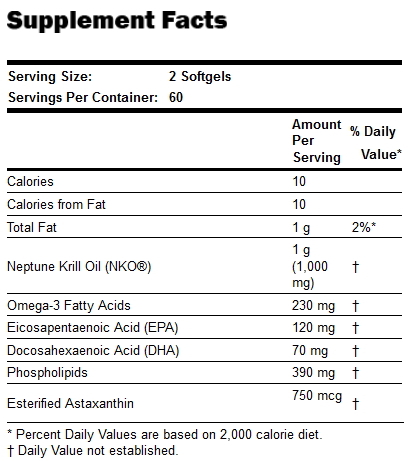 Neptune Krill Oil (NKO) is known for its unique fatty acid (FA) profile, as well as for its rich antioxidant content. NKO's balanced fatty acid content includes not only EPA and DHA, the crucial Omega-3 FA's, but Omega-9 FA's and phospholipids, as well. NKO is a rich source of Astaxanthin, a powerful immune-supporting antioxidant. Suggested Usage: As a dietary supplement, take 2 softgels 1 to 3 times daily with food.